Talk: "Making open science a reality, from a researcher perspective"
Last week I was in Paris (wonderful, but like London, a city that makes you understand Ankh-morpork) for the AgreenSkills+ annual meeting. AgreenSkills+ is a program for postdoc funding in France and the postdocs presented their works. Wednesday (#agreenskills) was a day to learn about Open Science, with other talks from Nancy Potinka and Ivo Grigorov from Foster Open Science, Martin Donnelly from the Edinburgh Digital Curation Centre about data management and the DMPonline tool, and Michael Witt of Purdue University about digital repositories and DataCite (which I should really make time to blog aobut too). 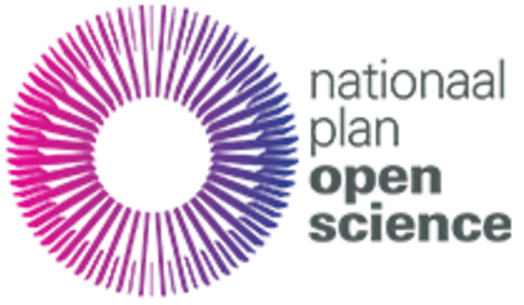 It has been hard to miss it: the Dutch National Plan Open Science (doi:10.4233/uuid:9e9fa82e-06c1-4d0d-9e20-5620259a6c65). It sets out an important step forward: it goes beyond Open Access publishing, which has become a tainted topic. After all, green Open Access does not provide enough rights. For example, teachers can still not share green Open Access publications with their students easily. I am happy I have been able to give feedback on a draft version, and hope it helped. During the weeks before the release I also looked how the Open Science working group of the Open Knowledge International foundation(?) is doing, and happy that at least the Dutch mailing list is still in action. Things are a bit in a flux, as the OKI is undergoing a migration to a new platform. Maybe more about that later. But one of my main comments was that there already is a lot of Open Science ongoing in The Netherlands. And then I am not talking about all those scientists that already publish part of their work as (gold) Open Access, but the many researchers that already share Open Data, Open Source, or other Open research outputs. 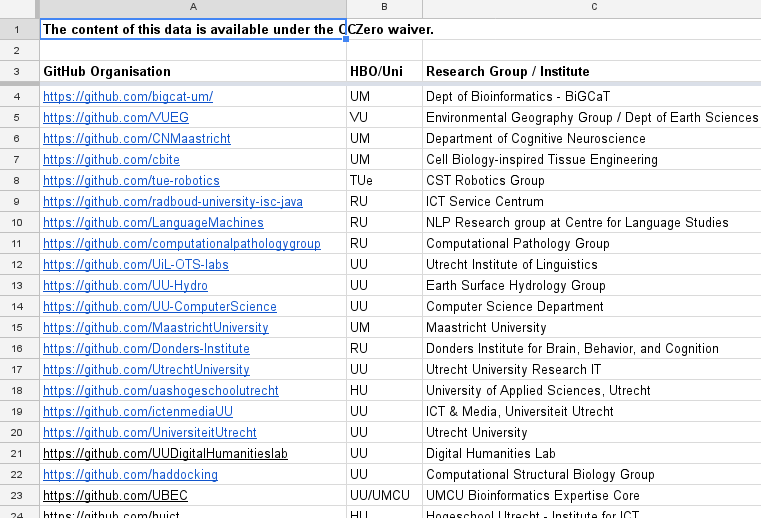 In fact, I started a public (CCZero) spreadsheet with GitHub repositories of Dutch research groups, which now also covers many educational groups, at our universities and "hogescholen". This now includes some fourty(!) git repositories, mostly on GitHub but also on GitLab. Wageningen even have their own public git website! Mind you, I had to educate myself a bit in the exact history of the term Open Science. It actually seems to go back to the USA Open Source community (see these references and particularly this article). 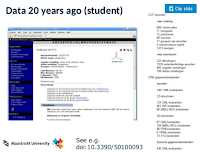 And that's actually where I also knew it from, in particular from Dan Gezelter, founding author of the well-known Jmol viewer for small molecules and protein structures, and host of the www.openscience.org domain.